In today’s world where fake news is everywhere, the last thing you would want for your business is to look unreal or appear bogus especially on social media. Facebook is one of top social network sites social media marketing experts suggest that your business should be part in order to increase brand awareness and engage with your audience. If you just created your Facebook Business Page or it’s been a long time your business is on Facebook, you’re posting relevant content, and sharing regularly at the best times but still your Facebook Fanbase count is still the same – or worse, decreasing, research and do more of the tips given by the experts. See what works for you and ditch the ones that don’t give you any good results. Whatever you do, don’t buy Facebook fans. When building your online presence, spreading fake news or not fact-checking really well enough your content is the first worse thing you can do. The next worse thing is buying Facebook fans. You may have a lot of Facebook fans thus making your business appear popular but aside from that, it does absolutely nothing for you. Instead of buying Facebook Fans, spend on boosting your posts instead. This will increase engagement and help drive more traffic to your site (if you posted a blog post). But how do you grow your Facebook fanbase? Strategize! In achieving anything you want, you have to strategize. In this case, start by reading tips and advice from the experts and how other people have done it. List down all the things you’ve read and try them one by one. In short, you’ll be experimenting with ideas. 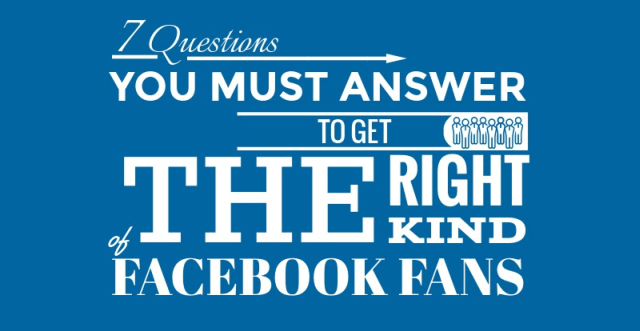 To help you more, here’s a useful guide by Mike Gingerich, social media marketing expert, shown in this infographic made with Visme the 7 questions you must answer that will help you get the right kind of Facebook fans. What is the online behavior of your target market? What pain does your target market have and how can you solve it? What language does your ideal customer use? What benefits do you offer customers that they can’t get elsewhere? What can you offer customers for free to attract them to your brand? Try also asking your customers and followers, they know what they want and all you have to do is ask the right questions and follow their answers. How about you? Have you discovered any techniques or hacks that help you to grow your Facebook Fanbase?